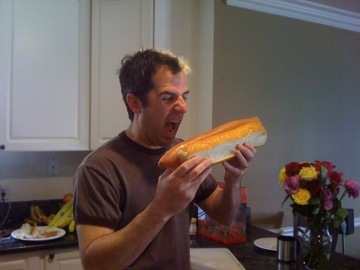 Welcome to the Giant Food section of Kookouts.com. 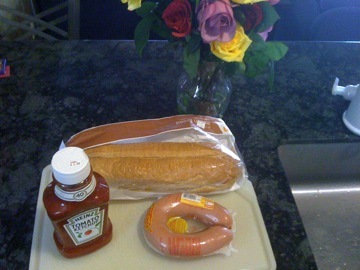 I’ll show you how to create a Kooky Cookout that features giant versions of your favorite foods. I call this type of thing a Kookout. 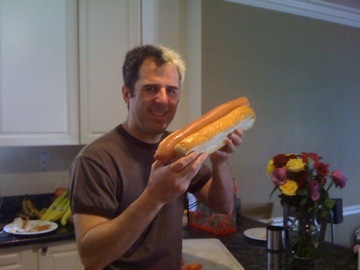 Here is a gigantic Hot Dog. I’ll give complete instructions this time. 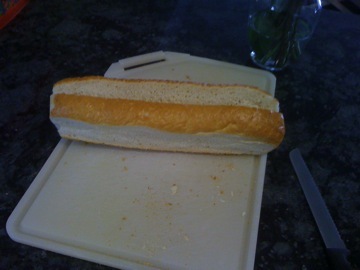 First, take the loaf of bread and turn it into a giant hot dog bun. To do this cut out a “V” in the center. I learned this technique by watching the guy at Subway to ensure he didn’t spit in my sub. 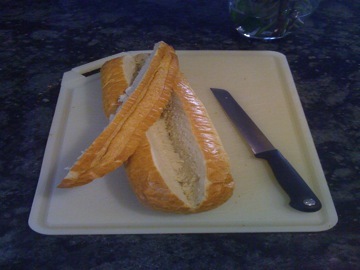 Next, trim all four sides of the loaf to give it that hot dog bun look. Next, cook the ring bologna. The weather was cruddy outside so I boiled mine. I had kids to feed. After cooking the bologna you may have to remove the outer casing. This wasn’t difficult. Put the ring bologna in the bun and you’re done! 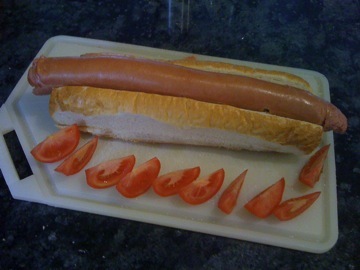 I used tomato slices to show scale. It was huge. Here is how big it is. Here are my kids chowing down. They were pretty excited about it. 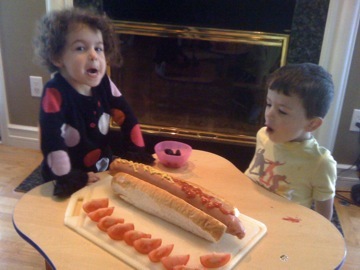 If you don’t have any three year olds you probably don’t understand just how delicious they think hot dogs really are.